HomeCurrent TopicsQatars OPEC Exit from latest burning issue from oil country. 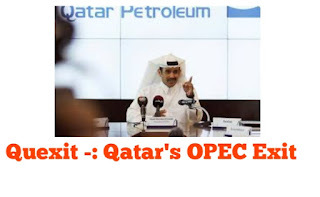 Quexit -Qatars OPEC Exit (Organization of Petroleum Exporting Country) recently, announced in 2018 that it will leave OPEC from January 2019. OPEC is organisation of the petroleum exporting country (not natural gas). OPEC has headquarter in Vienna, Austria which is not member of OPEC. The group was established in 1965. OPEC is also infamous for earning profit as they reduce supply of oil when they want to increase oil price. OPEC country has around 43% of global oil production and 73% of world’s oil reserves. OPEC has 2/3rd of oil production and reserves situated in 6 middle eastern (western Asia) Countries that surround the oil-reach persian gulf. Qatar announced it’s withdrawal from organisation for petroleum exporting Countries (OPEC) from the start of 2019, january. It will focus on the production of natural gas. The announcement will make Qatar as first gulf country to leave OPEC of oil- producing Countries led by Saudi Arabia. Qatar is not big oil export country. It’s main business is on liquified natural gas production. It is world’s largest exporter of liquified natural gas (LPG) and 17th largest producer of crude oil around 60000 barrel/day. Qatar holds only 2% of the total world’s global oil reserves and also it has around 1.5% to 2% share in OPEC production. There was always pressure on Qatar to produce more. So now the withdrawal decision reflects Qatars desire to focus it’s efforts to develop and increase it’s natural gas production from 77 million tonnes per year to 110 million tonnes in the coming years. Being part of OPEC Countries oil production was steady with limited prospects for increase. Since, 2013 amount of oil Qatar produced has steadily declined from about 728000 barrels per day (2013) to about 607000 barrels per day (2017) or just under 2% of OPEC’s total output. Blow to Saudi Arabia’s dominance Qatars OPEC exit is also geopolitical tustle that started last year is still far from over. It will also encourage other members of OPEC to take similar step if they are facing problem OPEC’s dominant Countries and will have own trading norms by giving up the membership. It is first time a Gulf Country leaving OPEC. It’s negative impact will be on Saudi Arabia as there will be questions on OPEC leadership.